Thanks for the info Keith! If you know anyone who wants a Darby 're-build' project, 'puffin' (Glen N) up in Chemainus has one for sale, or knows who does. Here is what I did with my Darby hull that I had. THe brass color dot that is in the hull below the center of the structure is the coupling pin that would be remotely controlled to extend and retract into the slot that was on the barge. That's the first ATB I've seen built off a 'Darby' hull. Looks like a pair of nozzles back there as well. Did you go with the 'Harbor Models' variety or fashion your own. I really like that, a sort of Amsterdarby! My ATB version of the Darby perform very well and yes there are Kort nozzles that have tripple rudder system hooked up as well. 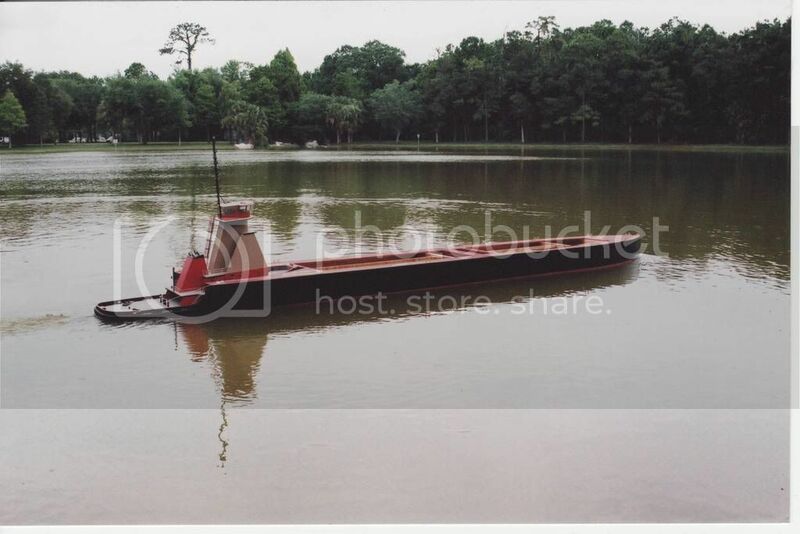 The barge that I made to work with the tug was 12 feet long anda 2 feet wide. I had to make the barge in two sections so that I could break it down for transportation. 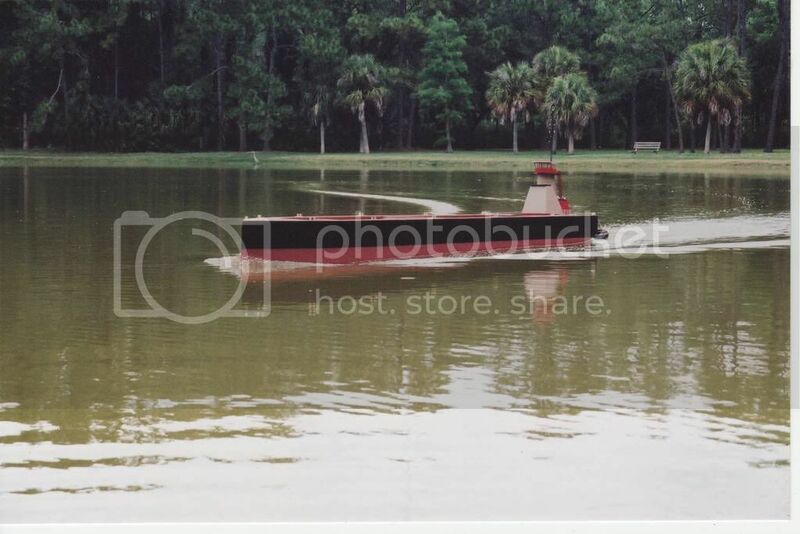 In all the barge when weighted down weighed in at just around 700 pounds and the tug had no problems in pushing it around the pond. When the tug was by it's self she would get a little rocky when wave action was on the large size when there were many boats on the pond and stirring up the water. I had compared it to another Darby that was built to the Dumas way and I was able to pull that Darby backwards with power to spare. I had used large Pittman motors on 12 volts that each motor ran at 3600 RPM's and direct drive to the props. Also when measured on a fish scale my pull on the scale would reach up to 28 ponds on fresh batteries. What props did you use...diameter and pitch? Do you still have her?? I just knew that someone...someday.... would make a 'Darby' into an ATB, as it's just the right hull for it. Here's a picture of the last 'Darby' I built...as Crowley Maritime's 'Sea Venture'. Twin 'Hectoperm' motors @ 3to1 reduction, 3.75" d props in custom aluminum nozzles. This model is now in the Crowley Offices in Jacksonville FL. Very nice Model..Model Tug Man!!!! The props that I had in her were from Prop shop at 3.5 inches in Dia and the max pitch that they had for that prop. The prop was also one that is used in kort nozzles only. I forget which Pittman motors I had in her but they were about 2.5 inches in dia and about 4.5 inches in lenght. I no longer have her any more sold her and about 8 months later the guy who bought had accidentally dropped the model onto concrete which damage the hull, he did repair it, but it became a differnet boat after that. 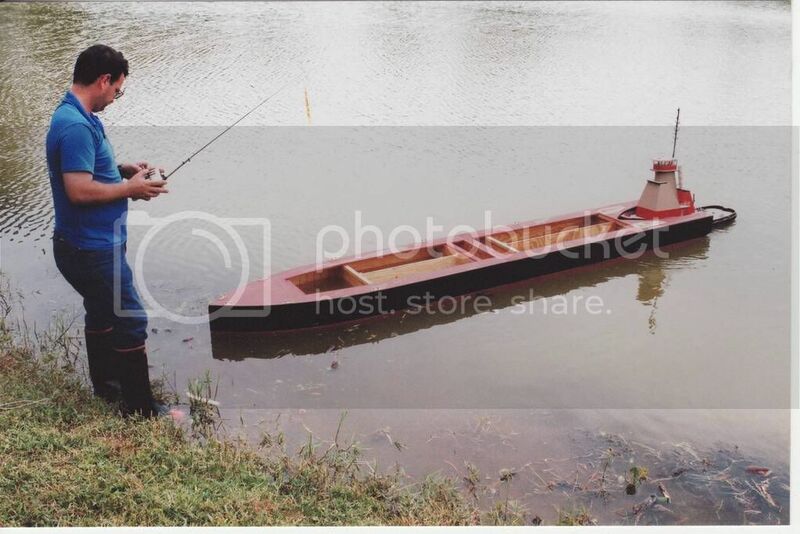 He always tried to handel the boat with batteries still in the model when it was out of the water, I told him that was a bad thing to do, much easier with the batteries out of the boat when not in the water. 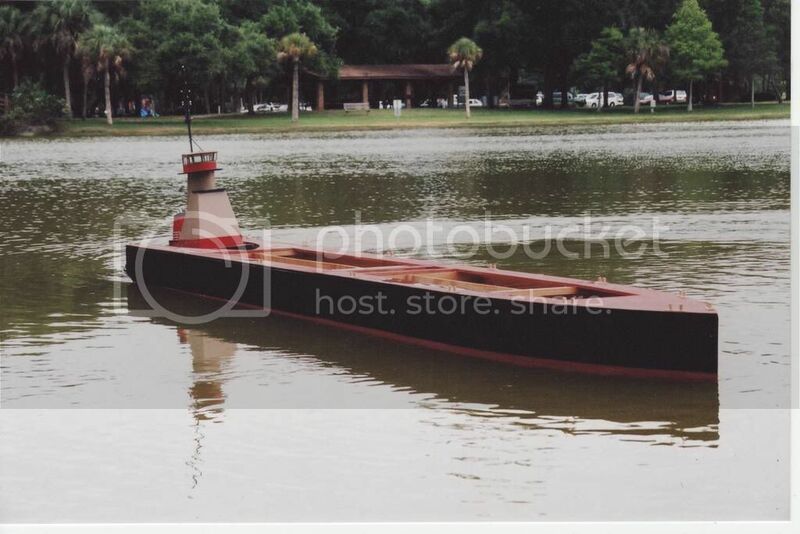 Here are a few more shoots of her with the large barge that I had made for her to handle. 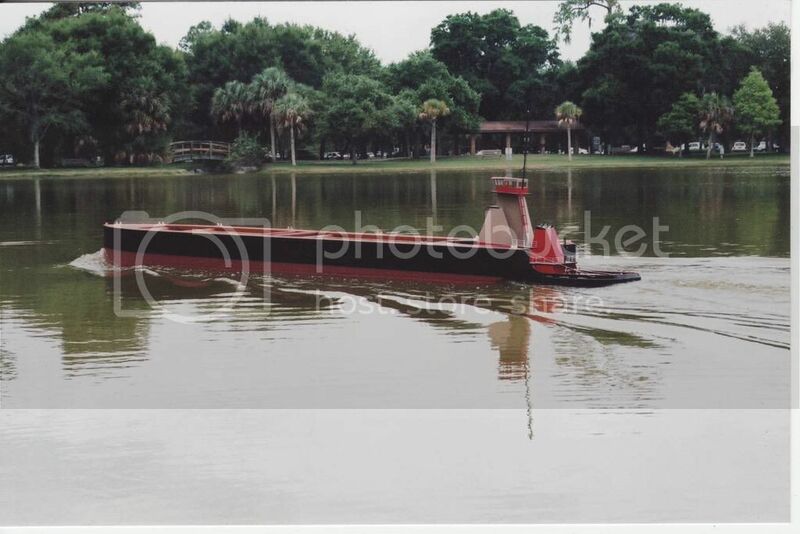 With the barge connected she was 14 feet long and I would let some of the club members push me into the docks for fun. 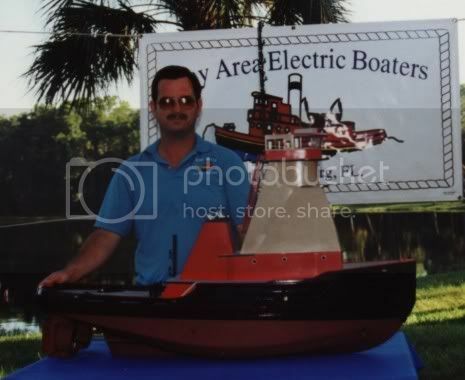 I have though of making another one maybe after I get a few of my Naval models done first, I am still trying to find some info on a UT 722L design anchor handeling tug would like to make one of them along with a UT 720 design as well. I can see you've got your tug ballasted down to where she should be too!! Efficiency is a key concern these days. Yup...you've gotta build another ATB Combo someday! Don't really know where you'll find UT designs, other than from the owners or builders. I have been trying so far I have by email a UT 755 design that I need to convert from CAD to a TIFF file so that I can have them printed up at the Blue Print shop. I have posted on this site about if it is possible t convert a UT 720 to a UT 722 design and there have been no replies to that post. Thanks for the comments about the ATB tug that I had, I do have a drawing of a 127 foot tig that I could possibly do the conversion to it has well for most of the ATB tugs seem to be around the 127 foot range, we will see that is a later project. The tug 'Barents Sea', on the Columbia River.